Final Surge is happy to announce our integration with the HRV4Training App, allowing users to sync their HRV and Resting Heart Rate data directly to Final Surge. HRV4Training is the only scientifically validated HRV app that doesn’t require an external sensor. HRV4Training helps you optimize your goals and prevent overtraining by measuring your Heart Rate Variability and providing tailored feedback on your physical condition. HRV4Training does not require a heart rate monitor since it can accurately assess your HRV using your phone’s camera. See validation and other publications at this link: http://www.hrv4training.com/publications.html. This data sync originates from inside the HRV4Training iOS or Android app. To enable the integration, go to Menu / Settings, select Final Surge in the Sync with Cloud Servers section, and then log in with your Final Surge credentials. 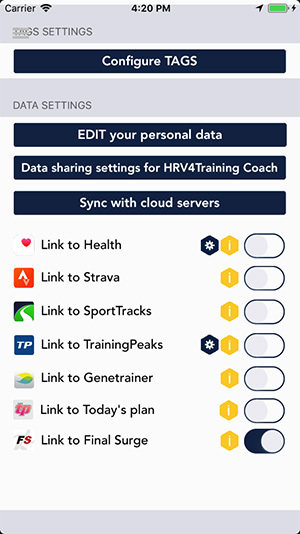 The Final Surge login will allow the HRV4Training App to push HRV data automatically each morning to the Daily Vitals section in your Final Surge account. Once the data starts syncing to Final Surge, your Daily Vitals graph will begin showing your HRV and Resting Heart Rate data in both the listing and chart formats. If you are interested in learning more about HRV and what this data represents, please continuing reading below for an in-depth analysis of this metric from a blog post shared by HRV4Training creator, Marco Altini. Heart rate variability (HRV) is an important marker of an individual’s physiological stress level. In the context of training, intense exercise is a potent stressor leading to higher physiological stress, which can be measured by HRV. For example, acute HRV can drop after high-intensity exercise, which can last for up to 48 hours post-exercise. This is part of the rationale behind measuring HRV to better understand our body’s response to training and optimize recovery. By combining HRV with other parameters and contextual information related to lifestyle and training, we can better understand how an athlete is adapting (or not adapting) to a specific training block, and try to make changes to avoid overtraining. Avoiding overtraining is one of the most important things that can be done to lead to better performance. Due to recent technological improvements in computation power and accessibility to high-quality wearable technology, we are seeing all sorts of applications making use of HRV today, from optimizing performance in sports, to monitoring psychological stress in the workplace. While HRV is a powerful tool and can be very helpful in better understanding physiological responses to both acute and chronic stressors, interpreting HRV data at the individual level can be challenging. This article focuses on practical ways to acquire and interpret HRV data in the context of monitoring training load and optimizing performance using HRV4Training. What’s HRV, why it matters and how to start collecting data? Practically speaking, our heart does not beat at a constant frequency. So even if we measure our pulse, and get 60 beats per minute, it doesn’t mean we have a beat every second. The time differences between beats are slightly different, they can be 0.9 seconds, 1.2 seconds, and so on. When we talk about HRV, we talk about ways to quantify this variation between heartbeats. This also explains why HRV is not a single number. There is sometimes a bit of confusion on different metrics to measure HRV since we can quantify these beat to beat differences in different ways. However, especially in the context of using HRV to monitor physiological stress, the community settled on one specific feature which is called rMSSD. It’s a time domain feature, easy to compute. So most commercial tools or apps will provide you with either rMSSD or with a transformation of rMSSD to make the value a bit easier to interpret. A typical transformation is scaling rMSSD between approximately 1 and 10 or 1 and 100. This is what HRV4Training does when providing what is called Recovery Points. The sympathetic branch is in charge of the fight or flight response, while the parasympathetic branch promotes a rest and recovery. Making a few simplifications and since the autonomic nervous system maintains an adaptive state of balance in our body, we can better understand how we react to different stressors by analyzing autonomic nervous system function. This means we would expect higher parasympathetic activity under conditions of rest when we are well recovered and rested. Since the autonomic system regulates the heart beating, we can use HRV as a proxy to autonomic nervous system function. Therefore, we can use HRV as a way to measure how we react to stressors. This is where collecting HRV data can become very interesting. We can start to figure out how much time our body needs to get back to normal after an intense workout, or spot the early onset of the flu, as well as understand how our body is reacting to big stressors like intercontinental travel or other life situations. How to get started with collecting your HRV data? Up to a few years ago, HRV was used mainly by academic researchers working at the intersection of sport, health, and medicine. Many of these experts were able to show links between HRV and performance as well as recovery or training load and chronic disease. However, in the recent past, many new, affordable and user-friendly tools have been developed. These tools typically rely on commercially available heart rate monitors (e.g., a Polar chest strap) to analyze data, compute HRV and provide guidance to the user. Most of these apps rely on spot measurements of about 1 minute. 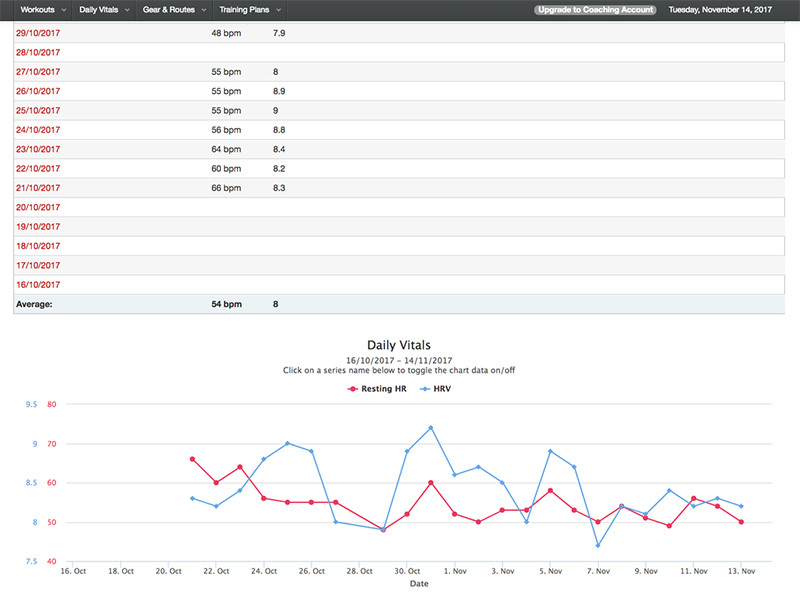 The latest developments go even a step further in terms of usability and accessibility. With apps like HRV4Training, HRV can be computed accurately without the need for any external sensor or device. The main advantages are the increased compliance and reduced cost. The techniques used by HRV4Training are scientifically validated, showing equivalency with not only a chest strap but also electrocardiography in measuring heart rate and heart rate variability (click here for reference). HRV4Training uses the phone camera to extract photoplethysmography (PPG, or simply blood flow from the finger) and then determine markers of the autonomic nervous system activity, in particular, parasympathetic activity. Regardless of the tool you decide to use, make sure the technology is reliable. For example, there are many optical watches out there, but almost all of them as of 2017 can only provide reliable HR, and not HRV, due to much averaging performed to stabilize the signal (https://www.quora.com/Is-there-any-wristband-activity-tracker-that-tracks-HRV-reliably-enough/answer/Marco-Altini?share=3fd61908). All you need to know about your HRV measurements. By quantifying parasympathetic activity, HRV4Training and other apps can translate HRV information into an assessment of stress level and provide actionable insights, helping users to understand better how their body responds to life stressors and other factors (e.g., sleep, stress, disease, etc.). Clinical studies were carried out under very specific, strict, laboratory conditions. Typically, this meant showing up at a lab early in the morning, measuring 2 hours after a light breakfast and at rest, a pre-measurement period including up to 30 minutes lying down in the lab, and so on. Even with the right tools, HRV can be difficult to gather under conditions similar to clinical conditions when measured in the wild. These measurement difficulties can make measurement interpretation harder. First, we need to look only at measurements with respect to ourselves. This means that as we collect more data and understand what are normal values for you, we can start looking at how much you deviate from your normal on a given day. Then we can provide tailored advice that can help in making adjustments to our daily routine. Additionally, our baseline HRV can improve over time with practices such as aerobic exercise and meditation. Secondly, we also need to control for as many of the previous factors as we can and then evaluate the effect of what we care about. Apps like HRV4Training provide a set of simple rules (or best practices) so that the measurements you take at home are as close as possible to supervised laboratory recordings making your data is more reliable. Take the measurement first thing after waking up, possibly while still in bed. This way you have consistent time of the day, and you are not affected by other stressors. When you take the measurement, it’s very important to try to relax, and not to think about other factors that might be stressing you out, like what’s coming up during the day. Lying down, sitting or standing are all good positions, again what matters is consistency. If you decide to stand, it’s very important to be patient, and wait a minute or two before starting the measurement, since your body needs to be at complete rest and measuring too early after standing up might affect the measurement. 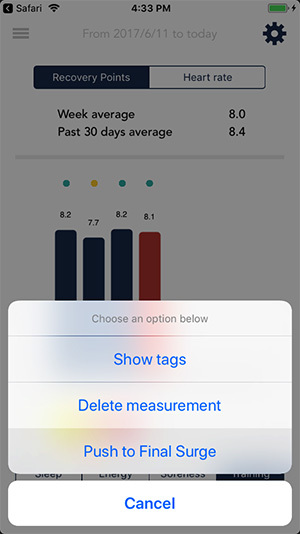 Most apps make following best practices easy for you by providing 60-second measurements and suggesting a morning measurement as part of your routine. While certain physiological responses to training have been shown consistently across broad populations (for example, reduced HRV after more intense workouts: https://www.researchgate.net/publication/301998958_HRV4Training_Large-Scale_Longitudinal_Training_Load_Analysis_in_Unconstrained_Free-Living_Settings_Using_a_Smartphone_Application) each individual is different and experiences stress differently. In particular, for recreational athletes, many other stressors might be present in life, such as a demanding job or a newborn in the family. Collecting data for several weeks before implementing changes will help better understand how we react to such stressors and consequently figure out when to take it easy, avoid additional stress, and when to push it in our workouts.